In the morning we will be transferred to the port of Piraeus to catch the local ferry to Santorini. Arrival in Santorini and transfer to your hotel. Rest of the day at leisure. After breakfast, transfer to the port of Santorini in time to catch the local high-speed ferry to Heraklion. Arrival in Crete and transfer to your hotel. Rest of the day at leisure. At leisure to explore the biggest of the Greek islands. Make sure to try the unique Cretan food, explore the Minoan civilization at Knossos, discover the beautiful beaches of Elounda, and enjoy a boat ride to historical Spinalonga. 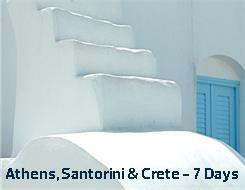 Athens, Santorini & Crete: Daily from April 1st to October 12th. Accommodation on BB, 2 nights in Athens, 2 nights in Santorini & 2 nights in Crete. Ferry tickets Piraeus - Santorini regular ferry and Santorini - Heraklion high-speed ferry, economy class.